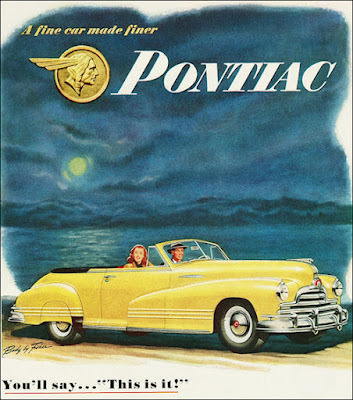 Since 1938, domestically-built Pontiacs shared bodies with Chevrolet. They were then mated to Pontiac trim. Grilles were modified to fit the differently shaped radiator opening and Chev bumpers were used. Styling was similar to the 1942 models. Interrupted by World War Two, marketing put its best foot forward by bragging that Pontiac was, “A fine car made finer”. Salesmen were instructed to point out the ‘refinements in appearance and mechanical design’. 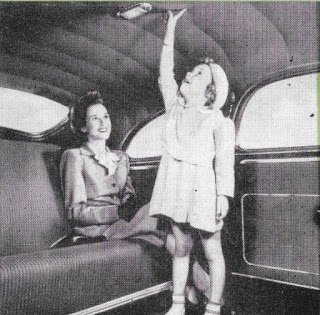 Running boards were concealed by the doors, although if a buyer wanted, Safety-Step running boards could be mounted. 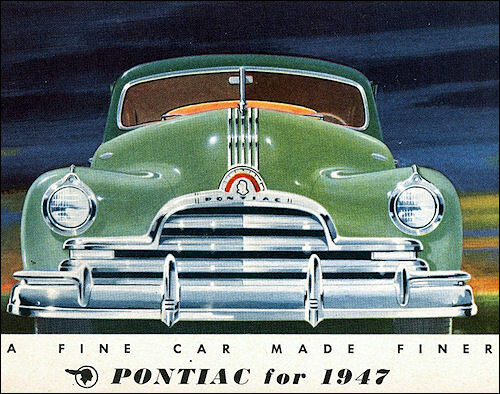 For 1947, Pontiac offered ‘new front end beauty’. The new grille opening was bold. It was also heavier than last year, designed to give the car a broad and lower appearance. A trio of gently bowed and subtly rounded chrome bars were stacked like pancakes. They were crowned with a substantial chrome arch and then crowned again with Chief Pontiac’s legendary likeness in yet a double arch, the inner one being red in colour. If that wasn’t enough, five—count ‘em—silver streaks topped the arches and ran along the centre of the hood to the cowl. And there was more. At the apex of this Niagara of chrome was a hood ornament in the shape of the brand’s Indian head mascot. ‘Safe Light’ parking lamps were tucked neatly between the lower two grille bars. Bumperettes were front and centre and wing guards mounted at the outer edges of the bumper. Headlamps were placed above the chromed arch. 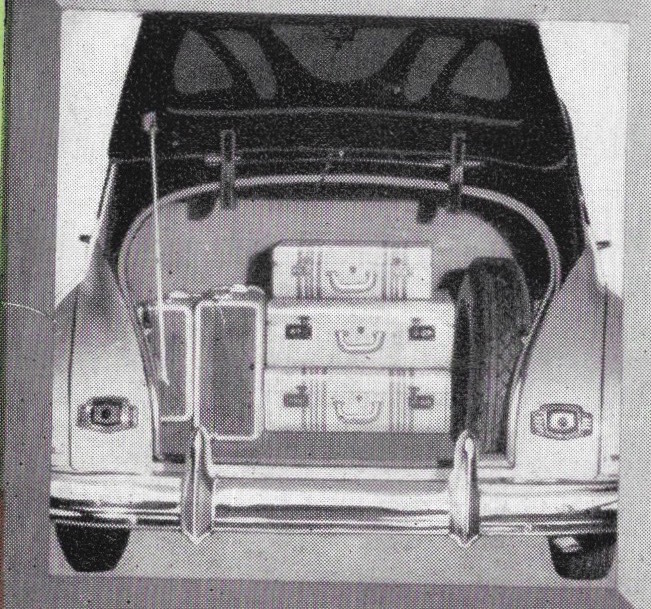 The Pontiac luggage compartment was enormous. The Fleetleader and Fleetleader Special was offered in a choice of four body styles. A two-door Fleetleader sedan delivery was also built, but was classified as a truck. These models were Canada only and not sold in the US. Fleetleader was for the budget conscious. Chrome was sparse. A feather-look spear graced the side of the hood, near the front door. Chrome moulding was affixed to the very bottom of the body. At $1,353, A three-passenger business coupe got the ball rolling. 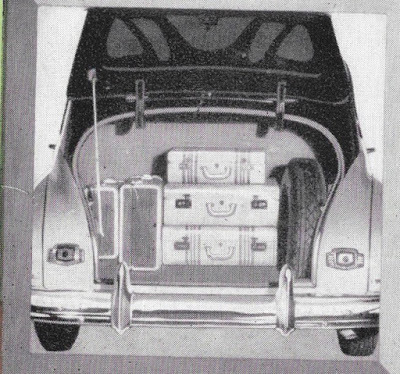 It boasted a capacious trunk for luggage and sample kits. This model was imported from the US. The Sport Coupe promised ‘dash and distinction’. It listed for $1,427. The six-cylinder, two-door Fleetleader Sedan sold for $1,444 fob Oshawa. Equally modest were the two- and four-door Fleetleader sedans with prices at $1,444 and $1516 respectively. Equipped with a clock, cigar lighter, ashtrays, front and rear arm rests and automatic interior lighting as standard features, Fleetleader Specials were better dressed. Outside they wore snazzy beltine trim and sported brightwork around the windows. The Pontiac Fleetleader Special two-door sedan sold for $1,548 when equipped with the base six-cylinder engine. New to Pontiac this season is the Fleetleader Special Sport four-door sedan. New this year was the Sport Sedan. Whether ‘duty-bound or pleasure-seeking”, this road-hugging beauty would ‘carry you and yours safely and luxuriously to your destination’. The refined ride cost only $1,564. The Pontiac Fleetleader Special Sport Coupe listed for $1,548. Advertising copy outdid itself by saying, "There's an air of rangy distinction in every singing line of this Fleetleader Special. Also in the Fleetleader Special series was a racy, fastback sedan coupe, that sold for $1589. More upscale was a quintet of ‘ultra-modern’ Torpedoes. They were longer, as they rode on a 3 022-millimetre (119-inch) wheelbase. Stylists ‘added deft touches and carefully planned details to improve an already outstanding design’. The trio of pinstripes that jazzed up the front and rear fenders were evidence of their importance. So were the heavier, flashier American-style wrap-around bumpers. The Torpedo Sedan Coupe $1,710. It was luxurious in everything but price. 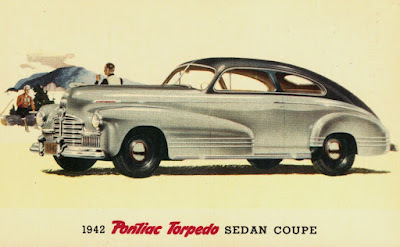 The Pontiac Torpedo two-door sedan matched a spirited look to spirited performance. It sold for $1,684 when bought with a six-cylinder engine.. In four-door sedan form, the six-cylinder Torpedo listed for $1,766. The only ragtop in this year's Pontiac family was the Torpedo Convertible Coupe. The open car cost $2,125 as a six and $2,82 with an eight-banger. Then there was the convertible. Leather was in short supply in the immediate years after the war. Nonetheless, hand-buffed colonial, genuine leather upholstery was offered in genuine hand-buffed colonial grain leather in black red, green blue or tan. A leather and whipcord combination could be had. Tops were black or natural. Other than the two-door Sport Coupe and the Convertible Coupe, all Torpedoes were built by workers in Oshawa. Good things come in threes and that is included Streamliner. The most expensive and best dressed of the Pontiac nation, these luxurious land yachts rode on their own 3 098-millimetre (122-inch wheelbase). 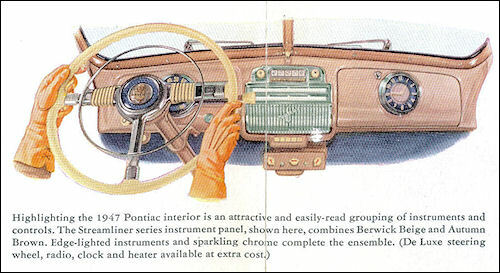 The Pontiac Streamliner two-door sedan carried a list price of $1,840 with a six-cylinder mill and $1,903 when ordered with the eight-cylinder engine. The four-door sedan showcased a beautifully proportioned fastback design. One wrote a cheque for $1,917 and added $60 more for the eight. Most expensive was the station wagon replete with mahogany body, framed in ash. Carrying six passengers, the six-cylinder model cost $2,659 and the straight eight emptied one's piggy bank of $2,714. Unique to the wagon was a $99 DeLuxe option that gave one a combination of red leather and wool cloth upholstery. While our American cousins had a third-seat option that gave the hauler a nine-passenger capacity, it was not offered to Canadians. 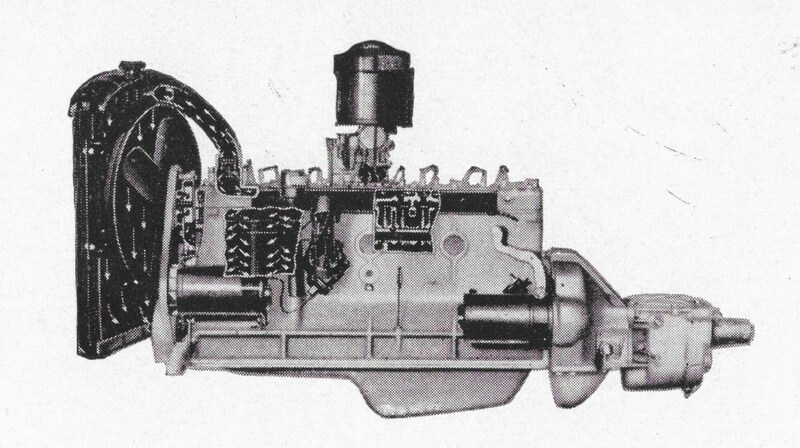 A six- or an eight-cylinder engine could be ordered for any Pontiac. 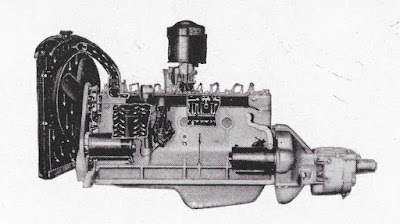 Six-cylinder engines were high compression, of the L-head design. Piston displacement was 3.9 litres (239.2 cubic inches), generating 67 kiloWatts (90 horsepower). The straight eight was rated at 77 kiloWatts (103 horsepower) thanks to the 4-1-litre (248.9 cubic inch) displacement. A three-speed manual transmission was used, with the lever mounted on the steering column. Exterior colour choices for the 1947 selling season were limited to Silver Wing Grey, Mariner Blue, Smoked Pearl, Para Wine, Black and Catalina Cream. Two-tone colour combinations included Light Grey and Blue as well as Light and Dark Grey. 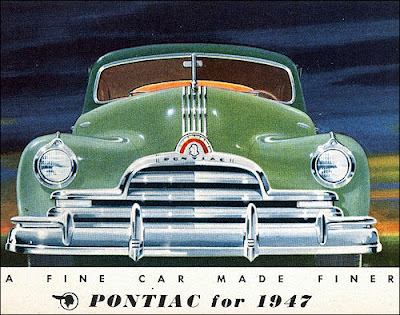 1947 model year production in Oshawa finished with 12,395 units. Imported from the US were the business coupe, the convertible and all three Streamliners—of which very few were sold. Importation of all goods from the US was severely limited as the federal government struggled to address a serious trade imbalance. Automakers were nearly cut off in the number of American-built vehicles allowed into the country. Only a handful of Pontiacs were sourced from the United States. © James C. Mays 2017 All rights reserved.